Corks on the quills of an Echidna = Safe; Really? I really enjoyed this post and the “points” by Max Geyer on his blog VIAMAX CONSULTING . Another example of over zealous zero harm style risk control creating a greater risk – how would the poor echidna defend itself from predators now?!! 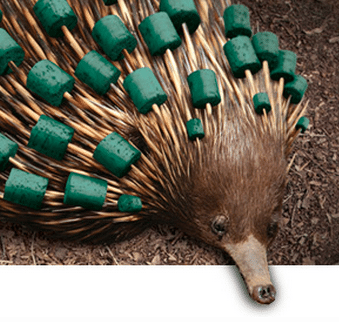 I have noticed the advert that goes with the NSCA LinkedIn site indicating that we will make the world (at least Australia) a better place by covering the quills of an Echidna with corks. So by changing the very nature of the beast and one of the key characteristics of the animal, which makes it relatively unique (my favourite little critter by the way) we have made the world safer – is that the message here? We have to change the very nature of nature to make us safe? Would we not be better served by educating people about identifying the hazards posed by the sharp quills and continue to appreciate the animal? I know it is a metaphor, but the discourse (the language and the message) used does nothing to help people in their daily lives manage risk; it tells us that only total protection can make us safe. Maybe the perfectionist safety person would say that it would be better to fence off all access to the animal so that we can’t be hurt if we are silly enough to grab an animal with needles all over it. That may stop the injuries, and us from ever appreciating these wonderful little creatures, but how does it help us understand that sharp pointy needles may injure us if we don’t treat them with respect. How does that educate people to better understand and manage risk? The post Corks on the quills of an Echidna = Safe–Really? appeared first on Safety and Risk Management. Previous post: Corks on the quills of an Echidna–Safe – seriously?